Wall-E Robots and Toys - the best gifts ever! �Robot Girl� - Hilarious �Barbie Girl� parody with robots! It�s a finger pointing right! �Flight Of The Wall-E Bee� shows Wall-E�s latest adventure where he sits down for a quiet evening of music on the magic piano from hell! This video stars the Wall-E iDance robot along with a few of the Wall-E and Eve action figures and includes cameo appearances by several of WowWee�s latest robots like The Bat, The FairyFly, good old Robosapien V1, and the amazing WowWee Alive Chimpanzee. If you want to know more about each of the robots and props that appeared in the video, see the Cast section below. If you want to be notified when we make new videos of Wall-E (or other robots) or receive other important information related to the latest and hottest toy robots, then subscribe to our consumer robots news service. We will also notify you when the much anticipated Ultimate Wall-E robot is available. If you liked this video you�ll love our music video parody of �Barbie Girl� called �Robot Girl�! Get the latest news & tips on the Wall-E toy robot family and other hot consumer robots as they become available. Subscribe now using this form. This robot did NOT appear in the movie. The Wall-E iDance robot is what you see doing most of the action. I�m listing it anyways to clarify the differences between the two. Also, this is not the Ultimate Wall-E robot that is coming out later this year, think of the U-Command Wall-E robot as the big brother to the i-Dance and the little brother to the upcoming Ultimate Wall-E robot. You can see this robot near the end of our hilarious �Robot Girl� video. The big Wall-E robot you see rolling up to Femisapien is the U-Command Wall-E robot. It comes with a remote control which allows you to drive it around and make Wall-E do other tricks like various Wall-E sounds and movements. 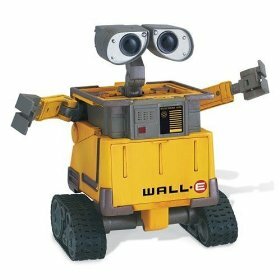 You can even program Wall-E to execute several commands in sequence at the press of a button. It�s a hyperactive fun little bot that moves really fast. This little guy is flat out hilarious. He is the star of �Flight Of The Bumblebee� and anytime you see Wall-E moving in an animated way in the video that�s him; the other shots are of one or two of the Wall-E (and Eva) action figures I have. He has two basic play modes. First, he can respond to loud sounds and when he hears them will do one of several different Wall-E animations (movements with sounds). Second, you can plug him in to your iPod or other music player and he will dance to the music! The Wall-E iDance robot is flat out nuts and hilarious just to watch. This is the original Robosapien robot that launched WowWee Toys into the spotlight. It was the first humanoid consumer robot to really hit the mass market and sold millions of units. He can walk, move his arms and forearms, is programmable, and is truly fun to own. I won�t make any comments about his questionable ability to drive a car as you can may have seen in the video. He has simple touch and sound sensors that will react to both and can execute a program you entered in to him when either he is touched or hears something. Click here to read more about Robosapien. The original Robosapien robot that launched the toy robot revolution. He�s the one driving the car next to Wall-E at the start. He farts, burps, throws things, walks, and does all the things a mischievous tiny humanoid robot needs to do. Click here to read more Robosapien V1 and his long list of features. I love putting this guy in my movies! I always get a bunch of comments from people on YouTube saying how creepy they think he is. The WowWee Alive Chimpanzee is very life-like! He has vision sensors to detect movement even in the dark, and can track objects close to his face with his eyes. This makes him amazing for the occasional prank, like when someone enters a room or opens up the refrigerator (yes I did that once)! He can be programmed to execute a series of stored movements on command, using the included remote control.